A live game-show where the audience makes up the rules. Who Wants to Be…? is a live multi-media game-show where the audience makes up all the rules on the fly. 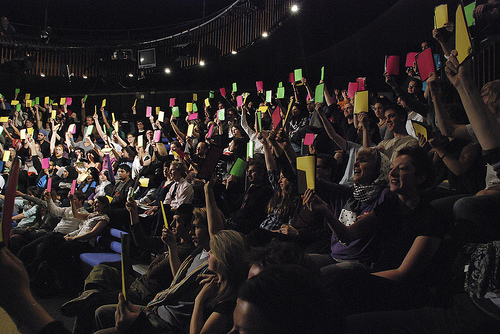 Inspired by legal scholar Peter Suber’s ‘Nomic’ game of self-amendment the show provides a crowd with an ‘ask-the-audience’ voting system, and facilitates discussions and voting on how to modify the rule-making system of the game as they play it – including how to spend the box-office takings. Each new audience has both shaped the gameplay for the next, and on different occasions have voted to collectively buy a woodland in Wales, purchase a generator for a Zambian health clinic, or even plant 3000 trees in the Colombian Amazon. Who Wants to Be…? has not only entertained theatre audiences, it has also been used as a public decision-making tool to decide how to invest in a much-loved local park and as a large-scale experiment in participatory budgeting for young people in London. Here is a video from a game held as part of the Newcastle Wunderbar Festival in 2009. The following people and organisations were instrumental in supporting, shaping and commissioning various iterations of this project. Peter Suber‘s Nomic, and Jo Walsh who introduced me to it. The People Speak page on the project has more images and links to write-ups of the games so far. Isis Arts in Newcastle hosted the residency where The People Speak developed the game. Nicky Adamson and Contemporary Arts Norwich for commissioning the first public version of the game. Dave Green and the London Games Festival for promoting the Unicorn Theatre version of the game. Emma Posey from Bloc and the May You Live in Interesting Times Festival who commissioned the Cardiff version. The Wunderbar Festival who commissioned the Newcastle game and especially Illana Mitchell and Christo Waller from Film Bee who made the video above. Christian Ulrik Andersen, Soren Pold and everyone at the Digital Aesthetics Research Centre in Aarhus who worked with us on the COP15 Un Climate Summit version, Pernille Kølbæk for hosting the Danish shows, and Salim Virani who helped build and advise on the online voting system. Michelle Kasprzak and the V2 team, especially Artem Baguinski for building the card-counting system. Dan Firth and the Listen Up! team at Islington Council, and the young people who worked on the Funderstorm participatory budgeting project. Chris Dickson’s lovely review really captures the ambition of Who Wants to Be…?